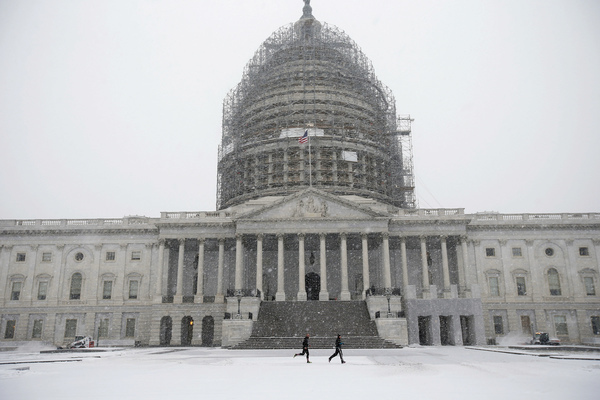 As predicted, the Washington area was blanketed by several inches of snow. Metro remains closed all weekend and local officials have urged motorists to stay off the roads. BLIZZARD WARNING FRIDAY AFTERNOON THROUGH SUNDAY 6 A.M.
A low pressure center off the North Carolina Coast is expected to pound the area with heavy snow. Storm Team 4's Steve Prinzvialli says snow will fall at the rate of one to three inches per hour with a rumble of two of thunder possible. Roads will deteriorate and become impassable in spots overnight. Winds will also rapidly increase overnight with sustained winds of 20 to 40 mph and gusts to 50 mph or higher. This could lead to power outages. The snow will continue heavy at times Saturday with some sleet mixing in throughout southern Maryland. Winds will continue to howl, keeping life-threatening blizzard conditions in place. Temperatures will hold in the 20s but wind chills will be near zero. WTOP is keeping a close eye on all of the region's preparations. Click here to follow the latest developments. WTOP has all of your resources for your commute. Click here for the latest traffic developments.